As a runner, I used to dread my off-days. I know running every day isn’t good over the long term. So once or twice a week, I’ll hop on an elliptical machine to supplement my running workouts. One of the reasons running appeals to me is that it has very concrete measurements that I’m familiar with. I know what it means to run 4 miles at a 9 minute pace, or to run a 5K at 7.5 mph. But on an elliptical machine, I struggled to understand if my workout was “good”. It all clicked for me when I discovered a handy feature that many modern ellipticals offer. I started syncing my Polar heart rate strap with the machine. The elliptical displays my heart rate on the console, meaning I don’t have to fiddle with my watch or a phone app. I soon learned I could use this to my advantage and actually make myself a better runner with my elliptical workouts! I’ll explain exactly what I did and how, but first I should clarify how fitness is measured by heart rate. My objective for my elliptical workouts is to increase my fitness for running, and I’m okay if that means I’m using less fat as fuel or not necessarily increasing my speed. My sweet spot for race running is 10K. If I was a 5K runner I’d probably focus more on HIIT training (the third zone), whereas if I was a marathon runner, I’d probably spend more time in the moderate zone (the first zone). A quick search online for “target heart rate,” will turn up dozens of charts instructing you to subtract your age from 220. This is hardly an accurate test as it doesn’t take into consideration the wide variation between fitness levels. If you’ve been exercising for quite some time, you can get your heart pumping at very high levels without risking danger. According to the charts, my max is 187 beats per minute. While I’ll admit this is by no means a comfortable state, it’s very much achievable for me during vigorous workouts. If I followed these charts, I’d spend time in the moderate zone even though I really want to be in the zone above it to increase my fitness. So now what? To get a really accurate heart rate analysis, I could go to a professional lab and undergo a VO2 max test. This is simply inaccessible to me and many people. Not to mention, it’s painful (as you have to push to your absolute max) and I’d have to retake the test regularly as my fitness changes. Instead, I took the DIY approach. Running Coach Jenny Hadfield has a good strategy that she outlines in more detail here. The gist is, you can tell what zone you’re in based on how easy it is to speak full sentences comfortably. To start measuring my zones, I spent two minutes on the elliptical with a resistance level 8. I could talk pretty easily so I moved it up to a 9. I glanced at my heart rate and I was hovering around 140. Two minutes later, I could still talk pretty easily so I moved it up again. Once I reached the point where I was struggling to catch my breath (level 12), I knew I had hit the second zone. Boom! I checked my heart rate. 168. Great, I took my phone and snapped a photo so I’d remember. 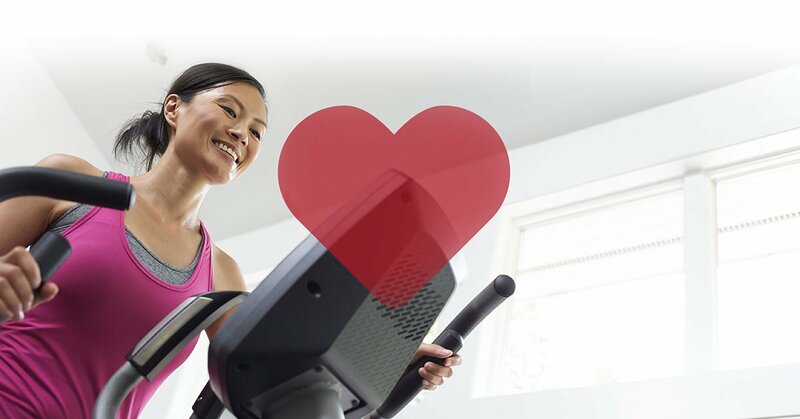 Now when I’m on the elliptical I make sure to maximize the time I spend with my heart rate around 160-175. Others may use the elliptical for advanced muscle targeting, for fat-burning or simply because they enjoy exercising on an elliptical! But as a runner, I have specific goals. Using a heart rate monitor helps me increase my fitness on my days off from running. And in doing so, I’ve learned to love my elliptical workouts. To make your heart rate tracking easier, select exercise equipment that will sync with Polar Chest Straps. Get a FREE Polar Chest Strap with Horizon Elite machines.